I have seen this one twice in the theater and I loved it both times. I know some people don't like these movies and have complained about things that are different from the original movies and tv show. I like the reboot and find these movies very entertaining and interesting. I have seen some of the original movies and tv show episodes, but I don't remember a lot of what happened in those. I went years without being interested in the movies or tv shows, but that has changed since the reboot and I want to watch the original movies here sometime. I'm not including any spoilers in this post. I'm not sure how much time has passed since the end of the first movie. Kirk and Spock are getting along better, though they still have conflicts. A mission doesn't go well, and Kirk and his crew have to deal with the fallout. While that is happening, a terrorist and former member of Star Fleet, John Harrison, attacks Star Fleet. Kirk and his crew are given a special mission to go after Harrison. The movie is showing in 2D and 3D. I saw the 2D version both times I saw the movie, so I have no idea how the 3D looks. I did notice a few images that might have looked cool if the 3D was taken advantage of. Abrams once again went over board with the lens flare to the point where it is distracting in some scenes. He needs to knock that crap off. The story is entertaining and it works well. There are things that tie back to the original movies, including one in particular, but things are different enough that it isn't just a retelling of a previous plot. There is a good amount of action and some violence that works with what is going on. The characters are familiar, yet they all have little differences here and there - like Scotty standing up to Kirk about something. There are a few little moments here and there that add humor from things that characters say or do. Bones does one of his "Dammit man" lines. In addition to the action and humor, there are also some emotional moments as well. I read something after I saw the movie that someone called one part hollow and cheap..I don't agree with that at all. That part worked in my opinion, and it did get to me. Benedict Cumberbatch is absolutely wonderful as Harrison. He has his reasons for why he is doing, and he is absolute in his convictions. He is chilling and makes a very strong villain. The rest of the cast does a good job with their parts as well, but Cumberbatch is the stand out. 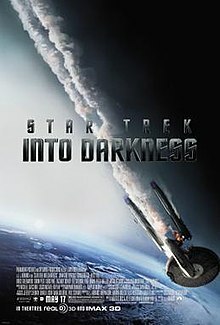 Star Trek Into Darkness is a great movie that is definitely worth seeing. I did post a longer review on Epinions - that is spoiler free - after seeing the movie the first time.